Join the discussion on our forums! Come discuss Magic Trick over in our dedicated Magic Trick discussion topic. 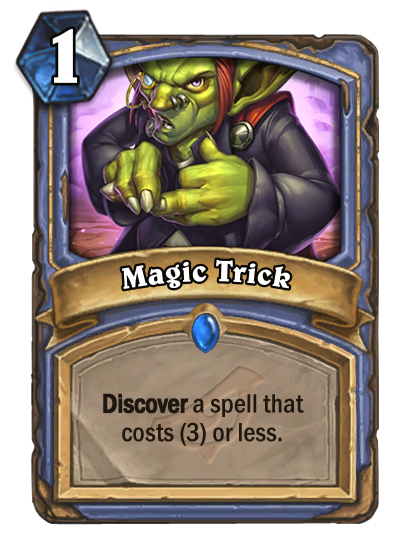 Discover a spell that costs (3) or less. The world is not ready for an illusion of this depth and intricacy! The art made me chuckle. What a clever goblin, able to pull off the ol' detachable thumb trick. Oh, I guess it's the index finger this time. Plot twist! Hey there my wanna see a trick, you don't mind if my friends Sorcerer's Apprentice and Mana Cyclone will be here as well? I want to put this in a Discover Mage deck soooo bad.